Mumbai: Between 2007 and 2012, the world has changed: it communicates through Twitter and has found a television Gandhi in Anna Hazare. But neither could change one thing: 46 per cent. The turnout in yesterday's Mumbai municipal elections. Appeals from the Bollywood brigade on Twitter and Anna’s volunteers, who sent fervent messages by phone and Facebook, had no impact as Mumbai turned its back on polling once again. Government offices had given the day off and private organisations had sent out emails relaxing work timings so that their staff could vote. But some youngsters saw that as an opportunity to sleep some more. “Our 9am reporting time was relaxed, which meant we could spend the time sleeping for a little longer in the nippy Mumbai weather. I would have voted if there was a hope of change from political parties. Since there is no hope, there is no vote,” said a 25-year old management employee, who did not vote but went to work late. Polling was sluggish form the start: 8.40 per cent between 7.30 and 9.30am, which rose to 22.18 per cent by 11.30am, stood at 25.89 per cent at 1.30pm, then rose to 35.07 per cent by 3.30pm before closing at around 46 per cent. The figure in 2007 was 46.05 per cent. An exasperated Anupam Kher, who belongs to both Bollywood and the Anna camp and had spent the day encouraging people to exercise their franchise, expressed his anguish. “Sad, disappointing and disillusioning voting percentage in Mumbai. What has happened to the heart, soul and sensitivity of this city?” he wrote. Potholed roads, water scarcity and traffic congestion — there seems to be reason enough for Mumbaikars to vote. But some newly eligible voters saw these very problems as reason to stay away from polling booths. “Our situation does not get better, no matter whom we elect. They think we are not responsible enough to drink, but can choose them to corrupt our country?” said a 20-year old media student, commenting on the increase in the permissible age for consuming alcohol in the state to 25 from 18, the legal age to vote. An estimated 2.87 lakh first time voters were eligible to vote in this election. Lyricist Gulzar, a Bandra resident, waited for more than an hour for polling officials to find his name on the list but had to return disappointed. 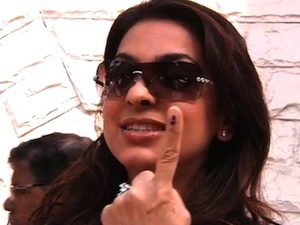 Actress Juhi Chawla admitted she voted for the first time. “Sometimes I was busy in work, sometimes I wasn’t. Then sometimes thought, what impact it would make if I vote,” said Chawla, a resident of Malabar Hill in south Mumbai. “The more you are learning, the more you are getting aware....let us first do our duty and then ask for our rights...get up from the comfort of watching television and vote.” The low turnout is expected to help the ruling Shiv Sena-BJP combine. Votes are being counted today..